The Circle Line (CCL) is Singapore’s fourth Mass Rapid Transit line, operated by SMRT. With the opening of the final 11 stations last month, running from Caldecott to HarbourFront, it marks the completion of the entire Circle Line. The new additions are really great as they link us to places like the up-and-coming one-north, and the ever popular Holland Village. Food lovers may now rejoice for travelling to Holland Village is made so much more convenient and travelling time is easily halved with the dedicated station! Since the Circle Line has opened up more opportunities for us to explore the various parts of Singapore that we wouldn’t have otherwise gone before, I thought it would be interesting to do up a post featuring some of the restaurants at the vicinity of each station! Yay to new reasons for us to venture out for more food! 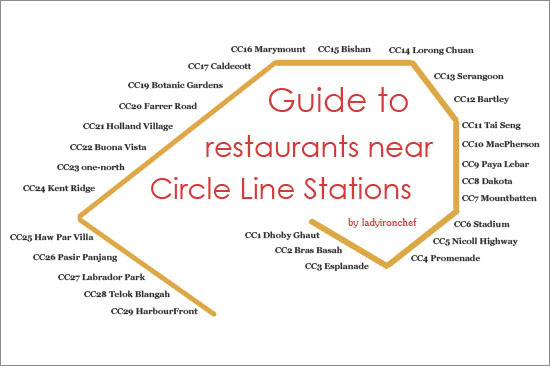 Here’s my Guide to the restaurants near Circle Line Stations. Let’s eat our way through Circle Line! It is no secret that I am a fan of Hokkien Mee. Tian Tian Lai Hokkien Mee is so good that I’d gladly go all the way to Toa Payoh just to satisfy my craving. Luckily for me, the new Caldecott MRT Station will cut down my travelling journey so that I will have more time for my food adventures! Botanic Gardens MRT station is located along Bukit Timah Road, not to be confused with the more familiar Napier Road entrance to the gardens. Previously, the only way to reach places such as Cluny Court, Serene Centre and Coronation Plaza is by buses which can be confusing at times! Relish is a gourmet burger speciality restaurant at Cluny Court, which is situated outside the new Botanic Gardens station. Try their signature Wild Rocket Burger! 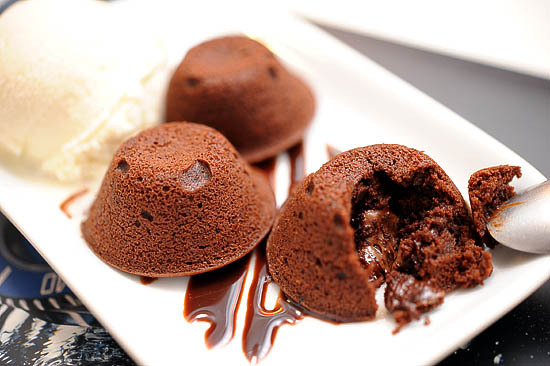 For desserts, you should go to 3 Inch Sin – a dessert shop that serves different freshly-baked warm chocolate cakes in unique flavours like orange, coffee, and peanut butter. When you ask around for the best Kong Bak Pau (Braised Pork Belly Bun) in Singapore, chances are, people will mention Westlake Restaurant at Queens Road. The good news is, with the opening of Farrer Road MRT Station on the Circle Line, Westlake Restaurant is a mere 5 minute walk away. Lorong Mambong, or more commonly known as Holland Village, is a very popular foodie paradise in the West of Singapore. La Nonna Italian restaurant has an ongoing lunch promotion, 50% off their ala carte menu for weekday lunch. For late night supper, Crystal Jade’s steamboat buffet with free flow xiao long bao is the best way to end the night with a group of friends. 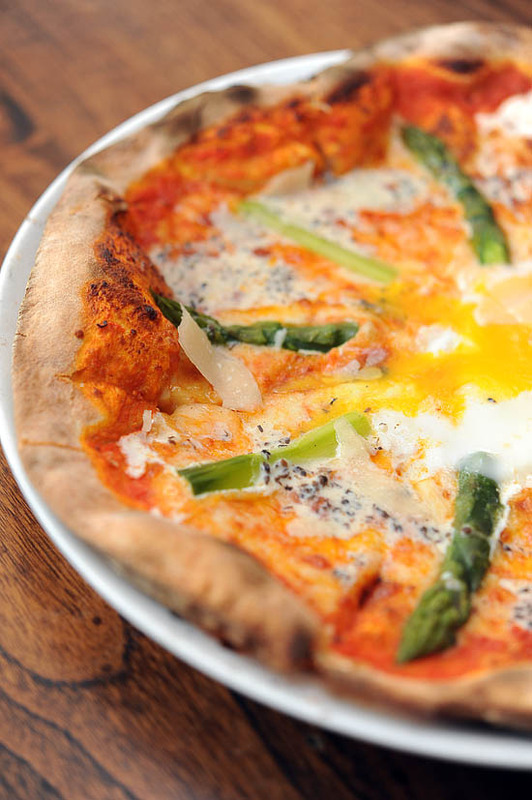 For more recommendations, read my guide to restaurants in Holland Village. With the new Circle Line, people living in the Bishan/Serangoon area can now travel to Buona Vista station in just 14 – 21 minutes. That’s a time savings of about 20 minutes compared to previously where you will have to transfer train at Jurong East MRT station to get onto the East-West Line to Buona Vista. Rochester Park – a five minutes walk away from Buona Vista MRT station – is a hidden dining enclave ideal for a romantic date. For a lazy brunch, Graze at Rochester Park is the perfect place. Otherwise, you can also go to Da Paolo restaurant for pizza and tiramisu. For more recommendations, please read my guide to Rochester Park Restaurants. If you do not want to go all the way to Penang just to satisfy your laksa and char koay teow craving, Penang Place Restaurant at Fusionopolis is the next best alternative. The Penang buffet is just $22.9++ for weekday lunch and $24.90++ for weekday dinner. For a quick and affordable lunch, there’s Shin Nichi Japanese restaurant. There’s just something about Japanese food that makes me happy. Sushi and Sashimi, anyone? For those of you who want to reminisce your university days, why not make a trip back to the National University of Singapore (NUS)? There’s nothing like cheap and good campus food. Ju Shin Jung has always been known as one of the best Korean BBQ restaurants in Singapore. Besides East Coast Park, they also have a branch at Yess Centre, opposite Haw Par Villa. The Korean BBQ Buffet is $29++ for lunch and $35++ for dinner. I am always on the lookout for cheap and good Thai food. One of the places that I always pass by but have never tried is E-Sarn Thai Corner along Pasir Panjang Road. I think it is high time I check out the Thai eatery since it is within walking distance from Pasir Panjang MRT Station. Another favourite place of mine is Bistro One Zero Three. It is a cosy cafe that serves homely food at reasonable prices. It is a place that I will always go back to when I want a nice and quiet place for dinner. Before the opening of the Circle Line, I had to take a bus from Harbourfront to get to Bistro One Zero Three. But now that there’s Pasir Panjang MRT Station which is a short 7 minutes ride from HarbourFront. Sometimes we choose to dine at a place because it serves really good food despite not having good service or ambience. Other times we focus more on the romantic ambience for special occasions. One such place is Hosted on the patio at Alexandra Road, directly opposite from the new Labrador Park MRT Station. 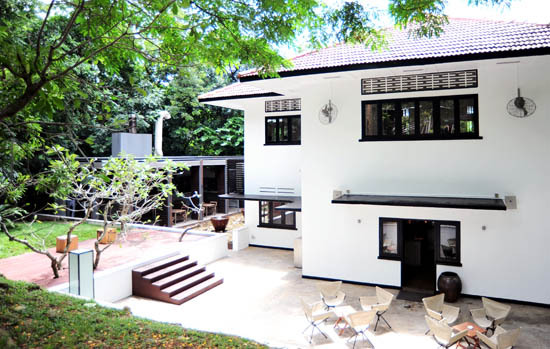 It is the perfect place if you want a sanctuary away from the hustle & bustle of our busy Singapore. In the same area, there is also Himawari Japanese Restaurant that serves Japanese buffet at $34.80++ for weekday dinner and $38.80++ for weekend dinner. The dim sum at Peony Jade is pretty decent, but so far I have only been there once as Keppel Club is really inaccessible without a car. All that changed with the opening of Telok Blangah MRT Station. Also, if you are craving for Nyonya food, PeraMakan at Keppel Club is one of the better Peranakan restaurants in Singapore. I will be having another SMRT food outing session on the 14th January 2012. Twenty lucky readers will be chosen to dine with me for free, so register for the food outing at the SMRT Circle Line page now! Till then, have fun exploring the previously forsaken parts of Singapore! Nice. This is a rather useful info for the likes of us who are recently connected to the train network thanks to the circle line. Noooo you just published my hugest foodie secret! I absolutely love Relish! The days of being able to dine at Relish without having to queue are over. Anyway, thanks for compiling this list, it’s really comprehensive! me me me! i’m coming back to spore on the 13th jan. just in time. haha. I am so sad that this page doesn’t have a guide, what happened?? ?